A lot has been made out of Michelle Obama’s campaign against obesity. It really seems to rub a lot of people the wrong way. The latest naysayer is Rush Limbaugh. 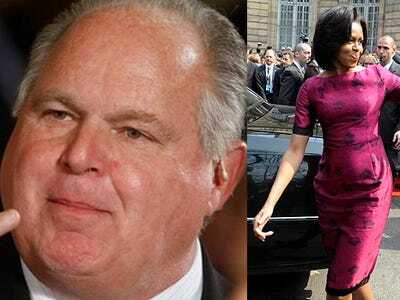 We can see where you’re going with this one, Mr. Limbaugh. You’re no Adonis yourself. Please stop. Because clearly an SI swimsuit model is the figure (no pun intended) that we would all like our First Lady to emulate. The mind reels.